1968: (March 21): Hundingr-Gisulf was born as Pier Paolo Gauna in Aosta, Italy. 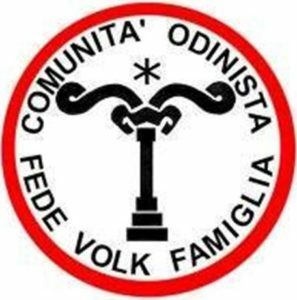 1994: (August): Hundingr-Gisulf founded the Comunità Odinista (CO) during a journey in Iceland and after the establishment of the English group Odinic Rite and the Belgian magazine Megin published by the group Fils des Ases. In the same year he started the magazine Araldo di Thule, that was linked to the CO and their principles. 1995: Hundingr-Gisulf met Gualtiero Cìola (1925-2000), who was called Walto Hari or Volksvater (father of the folk) by the CO faithful. He was very interested in the history of Northern Italy and Germany, and especially in the religion and culture of Longobards, a Germanic people who settled in Italy in the 568 BCE. Since the 1995 he wrote many articles for the Araldo di Thule. 1995: The CO received a visit from a Viennese member of the Armanen Orden. They decided to celebrate their first rites, called blòtar, in Piedmont and Aosta Valley. They also codified the monthly celebrations with the publication of the langbärte calendar and the book I fuochi di Gambara. These contained the first version of their rituals. 1997: The Hermandad Ásatrú Argentina, a group of descendants of Northern Italian immigrants located in Buenos Aires, contacted the CO. The two groups decided to cooperate and created the Alianza del Lobo. 1998: Beginning in this year some CO’s members have performed ritual and blótar with the English group Odinic Rite. 2000: The Hermandad Ásatrú Argentina became defunct. The CO terminated organization of Odinist groups outside the territory of Northern Italy and decided to manage their Italian brotherhoods in a more centralized way. 2007 (May): An online forum, Forum Odinista, was established with discussions reserved for members only. 2010: Access to the community became more structured and was divided into stages to guide the personal growth of the individual. 2017: Hundingr-Gisulf left the direct management of CO to the Corte di Gambara. The CO was inspired by Germanic mysticism led by the occultist Guido Von List (1848–1919) and also by the First Anglecyn Church of Odin, which was founded in Melbourne, Australia by Alexander Rudd-Mills (1885-1967) and was operative from 1929 to 1942. The CO was strongly influenced by the Danish founder of the Odinist Fellowship, Else Christensen (known as “the Folk Mother”) and the English group Odinic Rite (Introvigne and Zoccatelli 2013; Zoccatelli 2013). Hundingr-Gisulf founded the C.O. in 1994 during a trip in Iceland, grouping young people from Piedmont, Aosta Valley, Lombardy and Veneto. He chose Iceland connections, not because of connections with the local Asatruar, but because it was one of the last European tradition countries to convert to Christianity. After founding the CO, Paolo Gauna took the name Hundingr Gisulf and became the Goði“(“priest”) of the community. Hundingr-Gisulf followed traditional Odinism, but he was particularly focused on the longobard tribal heritage. His aim was to restore the faith to the ancient gods of the ancient longobard kingdom, which was very important in CO’s beliefs. The meeting between Hundingr-Gisulf and Gualtiero Cìola in 1995 was, therefore, a decisive moment. Cìola studied the longobard traditions of Northern Italy for years and published in 1987 Noi, Celti e Longobardi, a book that strongly inspired Hundingr Gisulf. After 1995, Cìola directly supported the CO and wrote many articles for the magazine l’Araldo di Thule (Comunità Odinista website n.d.; Zoccatelli, 2013). In 1997, Hundingr-Gisulf and Gualtiero Cìola established some links with international groups, like the Alianza del Lobo. They inspired the Comunità Odinista América, the Comunità Odinista Australia and Comunità Odinista Vinland to bring together the longobard heirs settled out of North Italy, although these groups have never been really operative. Currently, they are maintaining close relationships with the Odinic Rite (Comunità Odinista website n. d.; Zoccatelli 2013). CO’s beliefs and doctrines differ from those of other Nordic pagan movements. They consider themselves to be the heirs of a particular ancient ethnic group, the Longobards or Lombards, a Germanic people who arrived on the current territory of Italy in the sixth century. In this sense, they define themselves as a popular or, better, “folkish” movement. [Image at right] They reject the universalism typical of some neo-pagan groups. Their aim is the awakening of the ancient longobard spiritual and cultural heritage on their land, Langbard, which is a contraction of the term Langbardland. This homeland includes the current territory of North Italy, from the Ticino area to the Tuscany, and from the Valle d’Aosta to the Friuli. From the CO perspective, there is also another sacred country, the Nation of Odin, a sacred homeland, without geographical boundaries, for people who share the same ethnic and spiritual origins (Comunità Odinista website n.d.; Zoccatelli, 2013). For these reasons members define their faith as ethnocentric (Zoccatelli 2013). The blood, the ethnic identity, is indissoluble from the spiritual essence, and so the religion for them is a union of peoples based on ethnicity, but not in a mere biological sense. This approach has been defined by scholars as geneticist but, for the CO, the genetic affiliation is not a sufficient condition of belonging. They have specified that their ethnocentrism is without any supremacist or racist connotation, but it adheres to a tribal logic. In order to be eligible to join the community it is necessary to be from the North Italian territory, or from similar European regions, and to have what they consider a natural and healthy way of life (Comunità Odinista website n.d.). Members feel themselves connected not only to the Longbard people but also to other populations part of the Celtic cisalpine substratum of North Italy, or other Germanic groups (like the Cimbrians) who arrived before the Longobard in the Italian territory. These other traditions are part of what they define as “folkish Odinism” that reflects the CO’s broader openness towards the European tradition. Group life is based on the adherence to three principles: Faith, Folk and Family. Further, members must adhere to the following Nine Noble Virtues (the so-called NNV of Odinism, codified by Odinic Rite members John Yeowell (a.k.a. Stubba) and John Gibbs-Bailey (a.k.a. Hoskuld) in 1974): Courage, Truth, Honour, Loyalty, Discipline, Hospitality, Self-Reliance, Industriousness and Perseverance (Comunità Odinista website n.d.; Zoccatelli 2013). As symbol of the Langobardia Major, the name used by historians to define the ancient Lombard Kingdom, the CO shares, with other Odinists, a flag. [Image at right] On this ensign there is a heraldic eagle, a sacred animal for the Odinic tradition, with the rune Othala (from the germanic word Odal for the territory, the property, the settlement) on the chest that is related to the ancient germanic material and spiritual heritage. The red background is the blood shed by their ancestors (passed down to Barbarossa’s imperial flag and military uniforms), the white “X” is the rune Gebo (from the proto-Germanic gebô that means “gift”) symbolizing the donation by the gods of the earth to the Lombards at the end of their epic migration (Comunità Odinista website n.d.). Another significant symbol for the group is the Raven Banner with the rune Othala. The raven is a bird connected with the god Odin/Godan. The flag underlines the common spiritual origin and the preservation of the land of their ancestors (Comunità Odinista website n.d.). Concerning the theological structure, the C.O. worship a pantheon of gods and goddesses from the pre-Christian belief system common among the various Germanic peoples of Europe. The cycle of life-death-rebirth of human and animal life, of seasons and nature are all important to their beliefs. The gods are divided into two families, the Æsir and the Vanir. In the first family are divinities like Godan, Frea (the longobard names of the gods Odin and Frigg), Thor, Týr, Baldr, while in the second family are Njörðr, Freyr, and Freyja. They are invisible in the material domain, but real and present in the nine worlds of the Nordic cosmology and in the symbols and archetypes perceivable in the sensitive sphere (Comunità Odinista website n.d.; Zoccatelli 2013). Rituals and celebrations are fundamental in the life of the community. The CO uses the ancient word blótar (singular, blót), to indicate rituals in which they provide offerings to the gods. In the past, these performances usually consisted of animal sacrifices, but these no longer take place. In the CO, it is very important to pay attention to the animal’s rights and their protection; indeed, many members are vegetarians and they have an ecological approach to life that reflects the spiritual and religious values of the community. The CO established in 1995 on the langbärte calendar, monthly celebrations based on the circle of the year, studying the ancient sources and the Germanic agricultural calendar. [Image at right] The blót could also be dedicated to any god of the Norse pantheon, and the CO performs rituals like marriages, burials, ceremonies for the newborns and the investiture of new members as well. These festivals usually take place at night, outdoors, in natural sanctuaries called halgadom, but they may also take place in private places. The blót is led by a priest, the Goði, but all the members participate. The ritual consists of an initial moment of purification and meditation followed by the lighting up of the sacred fire, which symbolizes the union between men and the mother Earth. The ritual is interspersed with the chanting of galdrar (singular, galdr), something that we can translate with incantations. After that, they consult the futhark, the runic alphabet, and then they consecrate the mead with the Thorshammer, the sacred weapon and symbol of Thor. In this way the drink becomes a source of knowledge, and it is poured onto the sacred soil like a libation and shared and incorporated in all the members who are performing. This includes all ancestors and local spirits like the Alfar and the Disir. It is a kind of sacrifice of themselves to the gods, as Odin/Godan did in the Poetic Edda myths (Comunità Odinista website n.d.; Zoccatelli 2013). Another ritual performed by the CO is what is termed the “thing.” These are meetings in which the internal organization of the group and the external activities are discussed and regulated (Comunità Odinista website n.d.; Zoccatelli 2013). CO rites are not intended as historical re-enactments. Rather, they are intended to adapt the faith to the needs of the twenty-first century in order to make Odinism a valid and current answer for people, who are integrated into modern life. The community does not have a hierarchical organisation, but is structured in order to favor the contributions of each member. 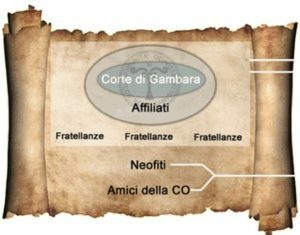 The Corte di Gambara [Image at right] is the governing council of the CO; the name refers to the mythical priestess and leader of the ancient Lombards people. The council establishes and organises the blótar, the “thing,” and all the other ritual performances. It also deals with the formation of the invocators, Goðar, (singular, Goði) and deliberates on the admission of new members. 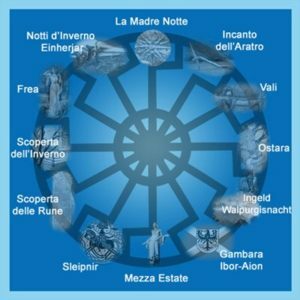 The official CO magazine, L’Araldo di Thule, is considered (like the calendar, the book I fuochi di Gambara and the forum Odinista) a training tool restricted to members. In the past, the CO was divided into local groups, called fratellanze, (brotherhoods), based on different regions. Today the autonomy of the various regions is still respected and encouraged, although there are no official groups or brotherhoods since the CO is managed centrally (Comunità Odinista website n.d.; Zoccatelli 2013). Hundingr-Gisulf, the CO founder, still plays the role of Goði and holds the title of “Goði of the whole community.” Therefore, during the rituals he is the invocator of all Lombard people. In 2017, Hundingr-Gisulf left the direct management of CO to fully dedicate himself to meditation and to contribute to the CO’s work, leaving the coordination role to the Corte di Gambara. The CO usually avoids direct outreach; the group is not interested in proselytizing and in increasing their numbers. They accept only those who are deeply interested in starting a serious spiritual path. Their focus is on the community, which is considered to be a family, and on the spiritual heritage that must be preserved and passed on to their descendants. They do not share the universalistic, syncretic or ideological positions (from any political persuasion) of other religious groups in the pagan panorama. For these reasons they have declined various offers of collaboration proposed to them. Currently the CO has close relationships only with the English group Odinic Rite. CO intends itself to be a movement without any political and ideological identity, and so the group does not pursue official recognition by the state as a religious organization. CO considers such recognition to be a contemporary and decadent neopagan concept, without any concrete effect or benefit. CO maintains its independence from all political-administrative entities, political parties, administrations and therefore does not accept any financial contributions. The members of the CO are all integrated into modern Italian society, but concerning their spiritual lives they do not recognize modern Italy as their cultural referent. Their real nation is Langbard. Their relationship with Italy as a nation is exclusively the promotion of group legality, respect for the law, and payment of mandatory taxes (Comunità Odinista website n.d.; Zoccatelli 2013). Image #1: The CO’s official logo with the principles Faith-Folk-Familiy. Copyright by Comunità Odinista. All rights reserved. 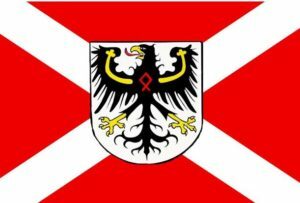 Image #2: Flag of Langbard. Image #3: Seasonal and monthly blótar scheme. Comunità Odinista website. n. d. Accessed from http://www.comunitaodinista.org/homepageco.htm on 20 May 2018. Introvigne, Massimo and Zoccatelli, Pierluigi. 2013. “Spiritualità tradizionali e celtiche e nostalgie sciamaniche.” Pp. 7-47 in in Enciclopedia delle religioni in Italia, edited by Massimo Introvigne and PierLuigi Zoccatelli. Torino: ElleDiCi. Zoccatelli, PierLuigi. 2013. “La nostra patria si chiama Langbard. Intervista alla Comunità Odinista.” Pp. 71-90 in Enciclopedia delle religioni in Italia, edited by Massimo Introvigne and PierLuigi Zoccatelli. Torino: ElleDiCi..